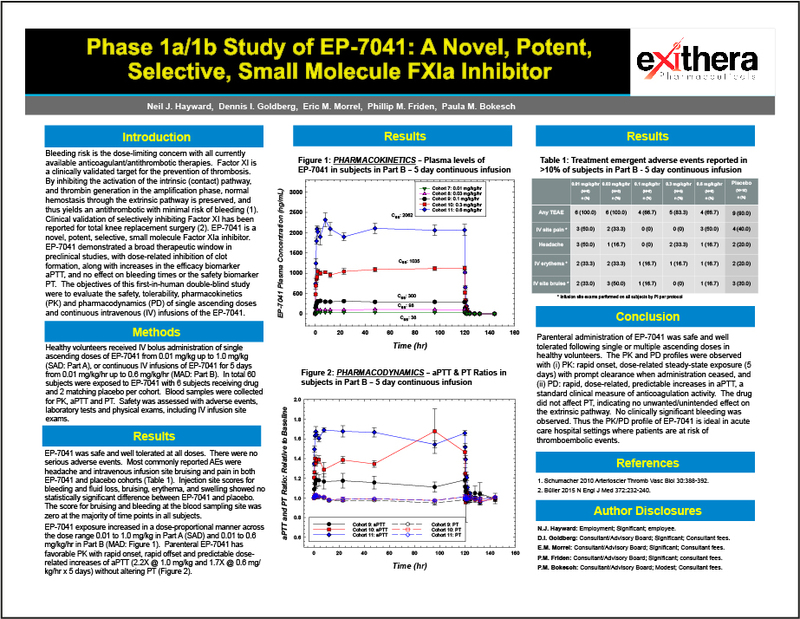 EP-7041 is a novel, potent, selective small molecule FXIa inhibitor designed to prevent thrombosis with limited risk for bleeding side effects. Results from the Phase 1a/1b study were highlighted in a poster presentation on Nov. 13 at the American Heart Association (AHA) Scientific Sessions 2017, in Anaheim, California. Antithrombotic EP-7041 safe and well tolerated; performed in antithrombotic test range associated with clinical efficacy and with fast onset/offset of activity. Phase 1 results suggest the PK/PD profile of EP-7041 is ideal in acute care hospital settings where patients are at risk of thromboembolic events.